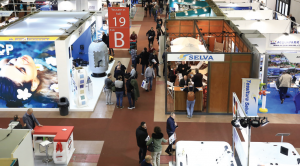 Over 7,500 people visited February’s ForumPiscine in Bologna, to see a vast array of exhibitors displaying core pool and spa products equipment, furnishings and accessories for fitness, wellness and water centres, including management software, safety systems, energy-saving appliances, and lots more. The numbers of foreign visitors are extraordinarily good too with foreign companies accounting for about 20% of the total; the largest groups came from Austria, France, Germany, Israel, Holland and Spain. A packed programme of 70 events, included conferences with paid admissions and free meetings, featuring over 80 speakers. The event was brimming over with professionals, experts and businessmen combining to put on a first-rate team that deployed an unprecedented range of educational events. Much of the focus was on new trends, the most innovative marketing and management tools, energy and water-saving regulations and solutions, and, the always very topical problem of safety. A big hit was Surfaces, the event that showcased internal and external facings for swimming pools and spas, with a focus on natural materials, ceramics, mosaics and applications, in a layout dotted with pictures and photos of the most intriguing residential and communal projects. Plans are already underway for next year’s Italian showcase which returns to Bologna from February 19th, 20th to the 21st, 2020.